The five strong British based contingents all had positive days on the penultimate stage of the Dakar with Stan Watt and Tim Forman moving up to 25th and 26th place respectively in the overall standings. For Forman his escalation in the standings came after finishing 28th on the stage today – his best result of the race to date. Stan Watt finished in 30th spot and while he is still nursing his shoulder he dislocated three days ago he has been able to ride well and remain consistent. Lyndon Poskitt also had an impressive day on his KTM and after starting the stage way down in 87th after yesterday’s problems he finished an impressive 37th which put him 46th overall. “It was a rough start being back in 87th. I had a lot of quads to get past, but I managed to stay patient and only passed them when I could see. Today I felt that I could have ridden faster, but I felt comfortable throughout the whole stage. Nobody passed me and I must have passed about 30 bikes. Simon Pavey found the majority of the stage top open and too fast, but enjoyed some parts and finished the day in 61st place a result that puts him 60th overall with one stage to go. 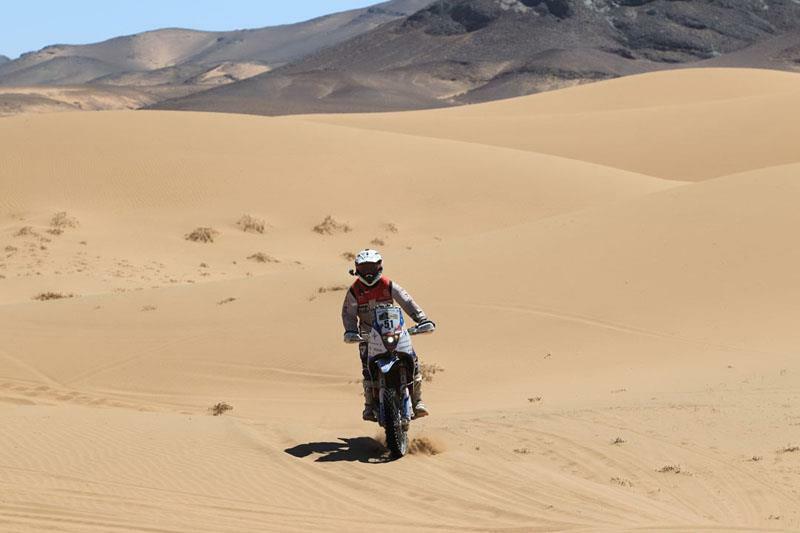 Craig Bounds’ hopes of completing the Dakar became one step closer to reality after the badly injured Welshman completed the 13th stage of the race in 94th position.